Samurai Dojo teaches Kimura Shukokai Karate in the Sydney CBD. Kimura Shukokai is known for applying the principles of biomechanics into its teaching. Samurai Dojo, located in the Sydney CBD, has its roots in Cape Town, South Africa. Sensei Paul started teaching Kimura Shukokai Karate in the original Samurai Karate Dojo, under Shihan Chris Thompson’s dojo in 1998. 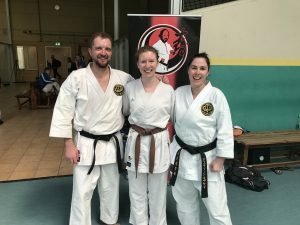 When Senseis Paul and Justine moved to Australia they wanted to continue teaching Kimura Shukokai. They started teaching Kimura Shukokai Karate in Sydney in August 2014. Karate can be an incredibly enriching, empowering and humbling endeavour. If you’re interested in learning what it’s all about, we invite new students to come along and give it a try.